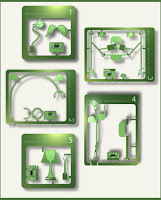 The Designer Emulation Kits (DEK) by Mark McKenna would be interesting in a miniature abode. 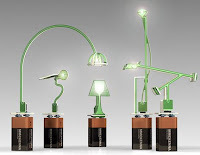 I dig on the versions inspired by Ingo Maurer’s Lucellino, Arco by Achille Castiglioni and Tizio by Richard Sapper. Each one of these LED lights (expected to last roughly 6 years) run on a standard 9 volt battery. Anyway, I think these would work in a miniature modern structure if you built some kind of casing or component around the battery. I think one might be able to use wood, polycarbonate, acrylic or concrete to hide the battery and give the light “sculpture status” or the illusion that it is sitting on a table. Course, you could forgo the battery altogether. The kits are $30.